Web dedicated languages. Web development tools. Apache web server has good documentation for installing and configuring, but where do you go for help with the day-to-day stuff, like adding common modules or fine-tuning your activity logging? 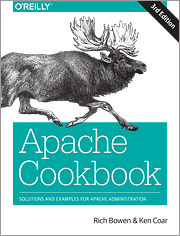 The third edition of this book provides more than 200 updated recipes for the latest versions of Apache, with practical examples for web administrators, programmers, and anyone else who works with the web server. For every problem addressed in the book, you’ll find short, focused pieces of code that you can use immediately. You also get explanations of how and why the code works, so you can adapt the problem-solving techniques to similar situations. Recipes range from simple tasks, such as installation, to complex tasks, such as setting up name-based virtual hosts. This cookbook has solutions for beginners and experienced users alike.